Restoration / Re: What is this firewall penetration for? The car is a real SS/RS so that makes sense. Can you tell me what the hole top left of the fuse box hole is? My firewall looks very similar and I asked a well known 67 expert what that and the "back up light hole" were and was told they both werent original. I was just getting ready to weld them both up. Thank you for the pic, at least I know what one is for now. Speedometer cable. 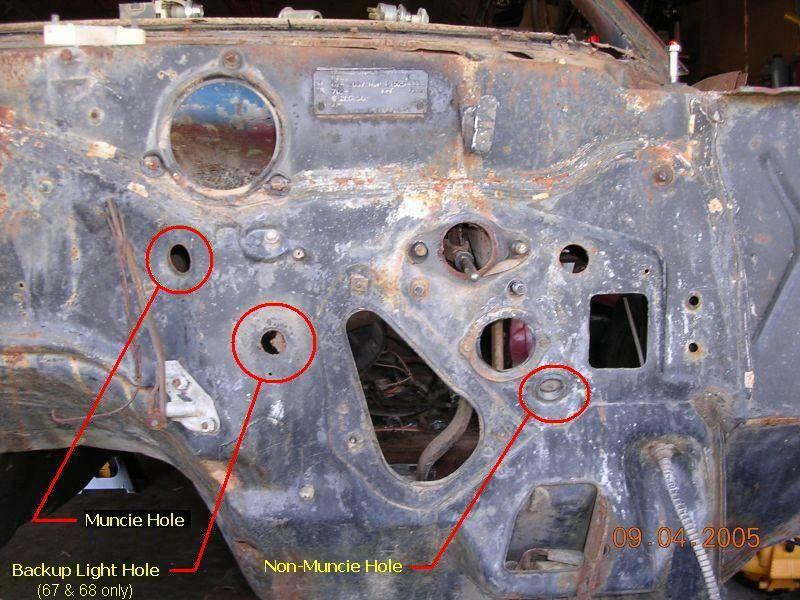 More info HERE, and the picture below ("Non-Muncie Hole"). Originality / Re: What transmission would have come standard with 67 4N coded BBC? There is a car in the lower mid west thats been for sale on & off over the past few years. Originally Gold/Gold IIRC but now its White w/ Blk and it is supposedly 100% numbers matching 325HP Auto on the column. Bench seat w/ center arm rest car. It might seem odd as we look at it today but back then, it wasnt a "muscle car" as much as it was just a "new car" and someone ordered what THEY wanted. So, I wouldnt doubt the authenticity of a column shift 325HP for a moment. Thanks to CRG, I clicked the link on Monday and got an envelope in the mail on Friday (which was a pleasant surprise considering the email confirmation that told me it would be 30 days). The dealer my car was sold new at was Kovich Chevrolet in Tamaqua PA. Apparently, at some point it became Hosak Pontiac and the address now shows a construction company but when I google map it, I see nothing remotely looking like any hint of a dealership of any sort ever being near there. Is there any chance anyone here has ever heard of that place &/or may know anything about it? I mean, a guy can dream, right?